Get Your Hands on Terry M. West’s ‘Cecil & Bubba Meet The Thang’ Now! Cecil & Bubba may seem to be little more than goofy hillbillies, but there’s much more to this dynamic duo than chew and overgrown beards. They’ve been cursed, and that curse brings some evil business in their direction. The most recent hazard to leap into the lives of Cecil & Bubba? I’ll give you a few hints: it doesn’t come from this planet, it’s not out to be friendly with earth and it’s gray. 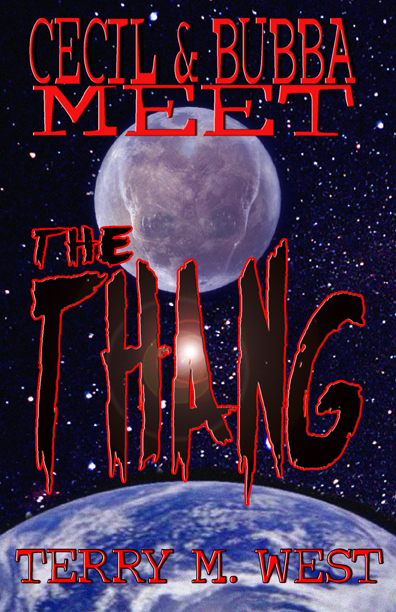 Cecil & Bubba Meet The Thang is an enjoyable little read (we’ll have our review up in a matter of hours) that is now officially on sale. For just $2.99 it’s hard to lose with this one! Do the right thing; order it here! 2 Comments on Get Your Hands on Terry M. West’s ‘Cecil & Bubba Meet The Thang’ Now!